Zoella Beauty: Sweet Inspirations. Worth the Hype? I finally caved into the Zoella beauty hype! The previous Zoella beauty releases have not grabbed me I just did not see the hype sure the ranges smelled nice but there were cheaper options around. Then the Sweet Inspirations range dropped and I knew I had to try it! The products theme is centered around French Patisseries and Macarons the packaging is sophisticated yet girly at the same time, the scent of these products is sweet and understated with hints of vanilla and almond to give the products the macaron scent they are supposed to have. 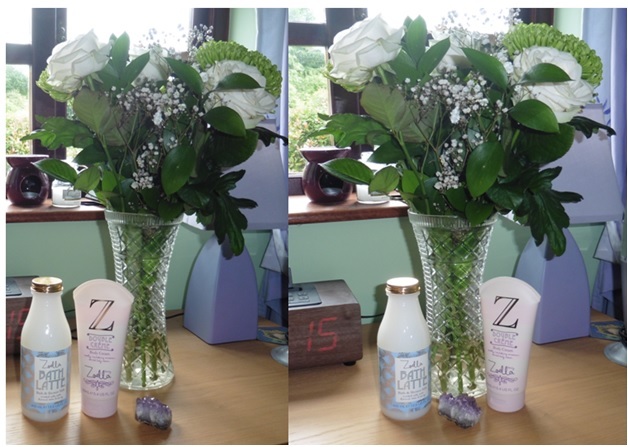 I got the Double Creme Body Cream and the Zoella Bath Latte. Zoella Bath Latte - I knew I had to have this the moment I saw the packaging. The idea of it being shaped like a milk bottle is pure genius! I tried the Latte in my bath the other night and a little definitely goes a long way, creating a relaxing bubble bath that smells divine. The product itself is gloopy (the only way I can think to describe it) you just run a bit of the product under the hot tap and you get a bath full of bubbles that softens your skin leaving it smelling oh so sweet! If you don't buy anything else from the range you should definitely buy this. Zoella Double Crème Body Cream - Again the smell of this product is just amazing so strong and it stays on your skin! The packaging follows the patisserie theme to a t. The muted pink and white stripes are so chic and understated. Out of the two this is my least favourite. I've found it to be a bit drying on my hands - not sure if that's because it's a body cream and not specifically designed for hands. That being said I do have dry and sensitive skin so maybe me and this product were just not a match. I do however love the smell so may test it out as more of a body moisturiser than a hand cream. Have you tried any products from the Sweet Inspirations range yet?